ABC Alert: Test Message. No action is required at this time. ABC Alert: This is a test message. No action is required at this time. 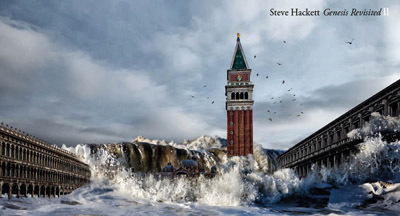 So Steve Hackett’s 2-disc collection Genesis Revisited II has been getting some serious airtime here despite all these reservations. Hackett enlisted a number of notable progstars for the collection, including Simon Collins, son of Phil, and a number of post-prog practicioners. Genesis Revisited I came in the late 90s. The current collection took several years to complete, and Hackett has said in interviews that he wanted to re-treat a lot of the parts that were hastily worked in the originals, and give a bit of a loving revisitation to songs that still, he notes, have a lot of meaning to him. Given how complex and historical some of the music is, it’s rather extraordinary that these are largely “faithful” reproductions of the originals, but with different musicians. The most jarring change is hearing other vocalists more or less imitating the vocal styles of Peter Gabriel and Phil Collins. (Simon Collins sounds a lot like his father, but he’s on just a few of these songs.) About 2/3rds of the collection are of PG-era Genesis. There’s a lot of music here, by the way, including some of the more ambitious tracks from the 70s like Supper’s Ready – which was, if I remember correctly, an entire side of Foxtrot. I also feel that overall, The Lamb Lies Down on Broadway has been the one prog concept album that I still listen to at least once a year. Great songs, high bombast concept, amazing analog synth textures throughout, some of Phil Collins’ best drumming ever…I still love this record with an almost maudlin sentimentality. Still, Hackett’s treatment conveys a love and respect for the originals that is disarming. First, there’s absolutely amazing attention to detail and fidelity to the compositions of these works, without completely slavish reproduction, but rather a focus on the intention of the compositions that feels both exuberant and even mature somehow. Nuance abounds. In one interview, Hackett talks about restoring a third guitar harmony to a track where that original part has gotten inadvertently lost. There’s a kind of perfectionist trend that becomes audible in the new tracks and is astonishing. The audio quality overall is excellent. The artwork in the CD sleeve is just plain beautiful, and makes it worth considering physical media on its merits alone. Beyond that, though, there’s some freedom to the interpretations and the subtle introduction of more modern effects on guitar, in the mix, on keyboards, on vocal treatments. But the fundamentals of Hackett’s style are not only intact here, but stand out as if to proclaim, “yes, I intended these guitar parts to sound exactly like this.” Sustain is the cornerstone of Hackett’s sound, and you hear it everywhere with amazing precision and attention to detail. You remember that Hackett was a rare rock guitarist who played sitting down most of the time. He has a distinctive style, and this collection is making a statement about his convictions. So everywhere, there’s that feeling of being disarmed against the bombast and ambitions/pretentiousness of the original material, and you hear these songs faults and all. It was never music everyone would love, and I wouldn’t be surprised or offended to see listeners sniffing at it and mocking a bit – I might be one of them. At the same time, I’ve kept listening, and feeling rather warm about the whole thing. It’s a technical achievement, sure. It’s rather fun to listen to after the passage of time. If you’re new to Genesis, especially the early stuff, you may find it incomprehensible. I’m not even sure whether you’d be better off listening to the originals, mostly to hear what Peter Gabriel was doing before his unusual solo career. But if you were there in the 70s and 80s and have a passing fondness for the originals, give this collection a spin and decide for yourself. I’ve come round on the it, big time. This is a fine way to revisit the past with a richer, adult perspective, and there is very fine musicianship everywhere in evidence. Ok, I’ll say it: I really like this record. No shame in that. The all new Power Outrage blog might be coming soon, so sorta stay tuned. We’re working on the WordPress stuff, etc. so hang tight.